Some Whine With Your Beta? 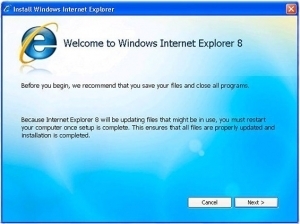 IE8 Beta has passed and an improved Internet Explorer 8 RC1 can’t come soon enough. I’ve struggled with compatibility mode provided with the beta version and Windows 7, but pages from Gmail and WordPress just don’t render. It’s especially frustrating to know that IE 8 RC1 is available for Vista 64 bit and XP 32 bit, but still not available for Windows 7 beta. I’ve long been a fan of Internet Explorer and have been forced to use FireFox while working in Windows 7. IE 8’s inability to render pages which jump to the screen using FireFox 3 and probably IE 6 is wearing me out. IE 8 has finally come of age with tabbed browsing and goes one further with color coding. Opening a new tab presents usable options that make sense, InPrivate Browsing, Google Search, Blog with Windows Live to name a few. Nice touch, but I still can’t get Internet Explorer to store passwords consistently. How hard can it be? Will my dreams of a fast IE ever be answered? I don’t know, but you can bet I’ll take a closer look by the next newsletter. Download IE 8 RC 1 here: Internet Explorer 8 RC1. The Pit Blog compatibility, compatibility mode, Explorer, Firefox, gmail, Google, internet explorer 8, RC1, WordPress. permalink. I am using IE8 RC1. I am blind and have nothing but problems with RC1. It will not display screens properly, and it wil not go to some websites “Page or site not available. I HATE IT!!! well i had java issues and a microsoft tech had me reset ie8 which i later discovered the man was a moron and doing the reset erased all of my autocomplete information. with the new autocomplete being just checkboxes it is hit and miss restoring my information.i figured out myself by trial and error it was an addon that was disabling java and i disabled it and now java works. i am having issues with ie8 telling me it can’t open hotmail. than when hotmail does open when you try to open an email its frozen. there are times when it says it is crashed and it goes into the microft scanning dance and than you get the close this program and than it doesn’t close. anyway rebooting vista helped ie8 and hotmail. oh yeah tabbed browsing. i discovered that some links will open in the main page and others open a new page. there is nothing to be done about that. Ok. Now how do you remove IE8 RC1? I don’t like it at all. IE 8 RC 1 is horrible and shouldn’t have been released in the first place. As a google mail user, and a wordpress design user it made my life a living hell. AVOID this one until MS figures out what it’s doing. I removed it after three days and went back to IE 7. Keep Google and Firefox handy kids it’s going to be a bumpy ride. If MS releases this as a completed program, AVOID IT! I tried IE8 RC1 for a few weeks. All it did for me was, lockup or hang up whatever you want to call it, almost everytime I tried to open a second or third window while IE was open. Had to constantly reboot the computer, went back to IE7 and the problem went away. Forced to use Firefox? I love firefox…much better then IE which freezes up as do many of the MS programs. Microsoft used to stand for innovation and greatness…now it just stands for let me see how aggravated I can make you as I freeze up then take you to a page that is supposed to tell you how to fix the problem…but it doesn’t. I didn’t upgrade IE the last time…because what’s the use? Shogan, “forced” to use Firefox? You say that like you don’t enjoy using it. I enjoy using Firefox. I keep Opera on hand for emergencies. I’m not gutsy enough to start trying Google’s Chrome yet, though I hear that’s an IE alternative. I had stopped using IE after version 6. IE just isn’t accessible, and now I hear its got the achy breakies. I installed IE8 RC1 Beta. it freezes up at times, is fast one day and very slow the next. I like the colored tabs. Still playing with this version for other problems. I installed IE 8 RC1. System freezes up periodically, seems slow, next day it seems faster. I am still playing with this Beta installation. I like the colored tabs. Tried the last beta and RC 1. Both locked up on the first screen, obvious problems on the networking end of things. Once I got it set up I tried to navigate with it, and got nowhere. Almost like it is trying to decide what to do and can’t, a typically Microsoft problem. Oh, I have a high speed broadband connection, plenty of RAM, and do not have the same issues with IE 6, which I reinstalled after ditching RC 1. That should never have been classified as a release candidate. IE8 on Windows 7 is awful. Slow, and crashes lots. Back to the drawing board. In my opinion, IE hasn’t really wowed me since version 5. Every release since then has been a “me too” and 8 is no different. Internet Explorer has had more fixes and versions than most people have had hot dinners.Firefox is faster better and a better plan for Microsoft would be stop developing new systems and fix the existing ones.Testing updates thoroughly before throwing spanners in the works would be a good start! More and more IT pros are abandoning IE and the general user will surely follow soon if Microsoft dont sort out their stall.Personally Im sold on Firefox and watch Opera with interest. Internet Explorer is just a waste of space. Is there a way to set up IE8 so that it opens a new URL as another tab in the window instead of a whole new window? I can’t find any way on IE7. I don’nt have a web site running yet but I’m trying my luck at building a web site and an internet business. Imagine my frustration when I installed IE8 and I started having all of the problem mention above and more. I also had to uninstall IE8 and reinstall IE7. I also tried to use Fire 3 in conjunction with IE7 but fund that it did’nt work to well. Is it that you cannot use the two together,? or maybe it’s because I’m not “TECKY” aneouf. Only problem I had with IE8 Beta was with Java apps. Does anyone know if that’s been resolved with RC1? I’d like to go back to IE8 if so (XP Pro 32bit and Vista Ultimate 64bit dual boot). I like FireFox more than IE thanks to the good Ad blocks that exists, but i don’t see a real difference in speed. Both loading sites are the same (in my experience), but FireFox tend to be slow when opening (clicking the icon desktop). I’ve had problems with ie8 and norton. Nortons phishing protection keeps being disabled, I also get message saying ie has stopped working and has to close, I click ok and ie keeps running, its a pain. I’m using firefox for the time being. I still don’t know what the fuss is about IE8, I actually hate it. It freezes to a point I have to shut my pc down. I tried to uninstall it and it won’t. Here’s something funny I can’t get into my msn email account using IE8. Hmm!! Tried to redownload IE7 and my Vista system says it is uncompatible. WTF?? I down loaded IE8, on my xp laptop, and it crashed my system, tryed to due a system restore but no avail didn’t work, tryed to relaod 7 but could not get on the net. I had to re-install the orginal software. a security application that will work with IE 8? Do not tell me Norton, never again. As you have noticed Internet Explorer is having problems, and Firefox isn’t. Wouldn’t it be better to stay with Firefox, or do you like the simplicity of Internet Explorer, which did look simpler in version 6. I upped to explorer 8…and it still takes too damn long for pages to open now even after getting faster internet speed.Tried lots of ways to fix but finding mozilla and opera are way way faster.What is up with this????? Unscrew gas cap, push clunker out of the way(IE), roll in FireFox, screw gas cap back on……………..Have fun on the internet.